The season of spring has arrived. 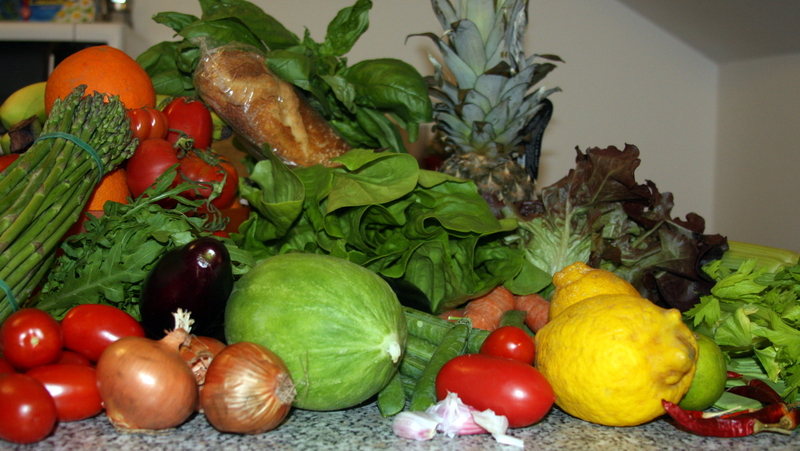 Here are some of the spoils from shopping at the ortofrutta (fruit & vegetable stands) this afternoon. One of the best things about living in Italy is the freshness and quality of the local food. When we lived in Pietrelcina last year, Michael’s family gave us fresh produce and eggs right off their farms. In Pesaro, we do all right by the ortofrutta. Nearly every day, vendors come up from the south to sell their harvest to central and northern cities. Last month, lemon growers from the island of Procida (off the Amalfi Coast) were invited by the Pesaro archdiocese to sell their fruit and we bought a few kilos. Today, we bought asparagus, cucumbers, green beans, eggplant, peas and tomatoes, among other items. We also bought basil, something you can find in most stores during any season in the U.S., but only at specific times in Italy. Today was the first time we’d seen basil in the markets since last summer. We also bought oranges because we love spremuta–fresh squeezed orange juice–but unfortunately the blood orange season has passed. In January through March—the season’s height—we had fresh squeezed blood orange juice every morning. We chose from three types of blood oranges from Sicily: the Moro, Sanguinello and Tarocco. We found that the Moros were consistently darker (read: purple) and more bitter than the Sanguinello and Tarocco oranges, which tended to be more speckled with shades of orange and red. All three are delicious and it’s something I’ll miss when we return home! Something I really appreciate about living in Italy is shopping at the ortofrutta every day. Italy does have more supermarkets than in the past, but if you want to eat extremely fresh food, it’s better to shop at the local markets. Plus, it’s a good way to practice Italian with the vendors while savoring the delightful sights, sounds and scents of Italy. This entry was posted in food, fresh produce, Italy, markets, ortofrutta and tagged blood oranges, food, Italy, local harvest, markets. Bookmark the permalink.